Before university starts, I wanted to finish the last cosplay project of the summer, but I didn't want to buy new material. I had a lot of white satin, a lot of pearl beads and acrylic gems, some white tulle, and gold satin. 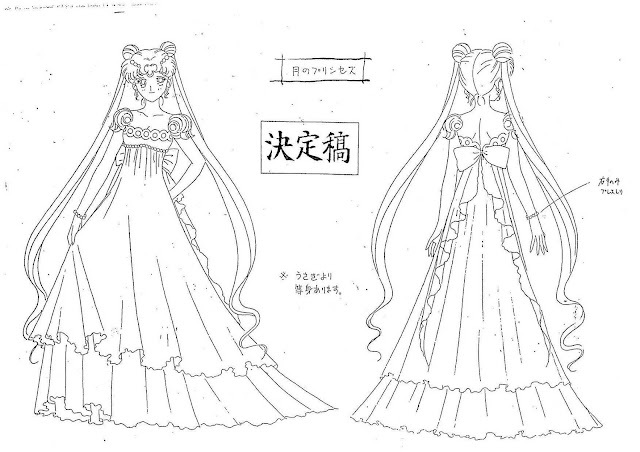 So I decided to make Princess Serenity's dress (Sailor Moon). The advantage of making this costume is that it also doubles as a Fionna the Human (Adventure Time) costume. It's not identical, but close enough, especially if I wear the bunny hat. I quickly sewed a fleece bunny hat, just in case I can't get hold of a wig for Usagi. The first step was the cut the bodice and the skirt. I used a Burda style pattern for the bodice. it was originally a sweetheart neckline but I altered it. If I were to do it again, I would have made it straighter along the top, as currently it has a slight curve. I started by cutting the bodice from white cotton, so that I oculd alter it to suit the dress. 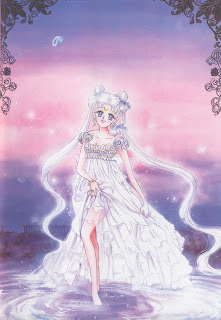 I cut the half circle skirt immediately from white satin; it's the same material I used to make Sakziou Juliet's skirt. I could not attach the lining fully until I had completed embellishing the bodice, so I simply attached the lining at the top to create the scallops. In hindsight it would have been simpler to make the top of the bodice straight, then to tack on the circles. Before I added the lining, I used the seam allowance to create boning channels in all the seams except for the back seam. I added a boning channel in the centre front for extra support. The anime Princess Serenity has quite a simple design on her bodice, with just the circles and a line of beads under the bust. I wasn't making an empire line dress, and I preferred the more detailed look of the dress from the art books, so I added a lot more embellishment. Firstly I sewed a piece of white lace on to the bodice. I had to fold it slightly to make it fit the curve of the bust. Next I sewed a line of pearl bead under the gold circles, and some gold-painted cord in loop shapes underneath (I think the technique is called couching). I thought it still looked plain, so I sewed on some more beads and gems. I took a break from the bodice and made the sleeves. Each sleeve is a rectangle of slightly transparent cloth. I folded the cloth rectangles in half and sewed them into a tube. I turned each tube inside out. Down one edge I sewed a piece of lace, then I sewed channels for elastic at the top and bottom of the rectangle. I threaded elastic through each casing, then over locked the edges and sewed them together. The sleeves were probably the easiest part of the costume. 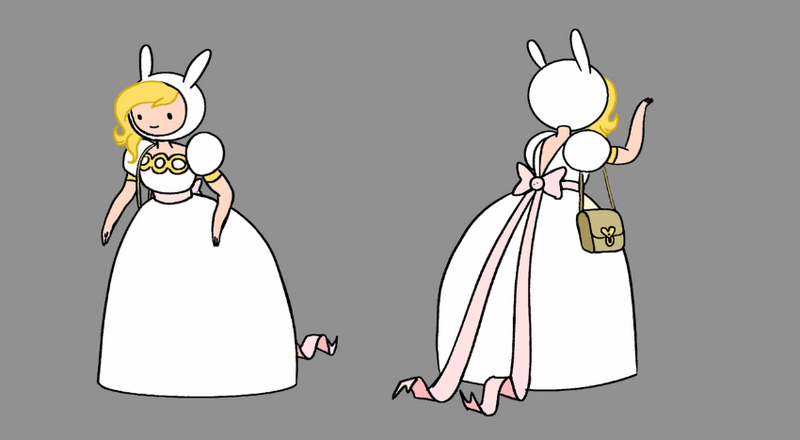 The bow is made of tulle. I used My Cute Bow's tutorial. The bow is a little bit floppy and might be remade. It is basically two rectangles of tulle sewn together, and a piece of tulle shaped a bit like a swallow-tail butterfly. Before adding a zip, I overlocked the hem, and added an in seam pocket. Weirdly, the skirt pieces seemed to stretch, so that some edges were much longer. I think the dress needed to hang for longer, but I didn't want to waste time. I trimmed the hem, Overlocked it again, and sewed everything together. I tacked and sewed an invisible zip, and hand sewed the lining to the inside of the bodice. I also added some clear elastic straps. 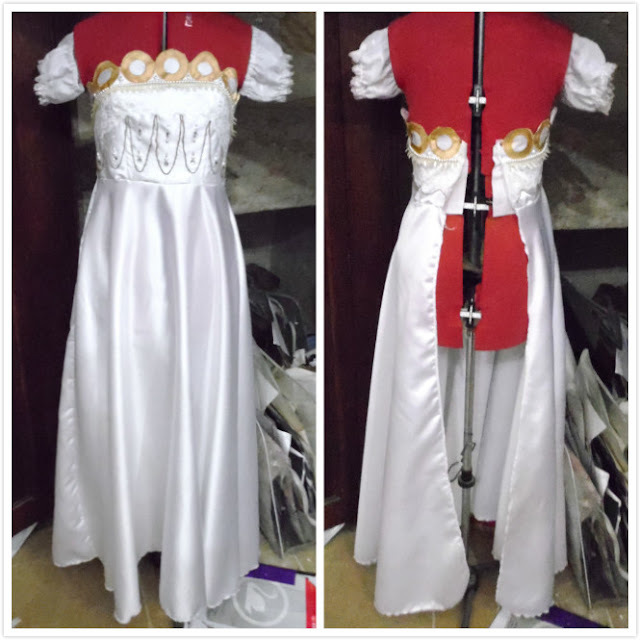 The final step was to sew a row of pearl beads all around the waist of the dress. Here's what the dress looks like. I shoved on my Female Titan wig because it was the first one at hand. I don't have an Usagi wig, so I styled it as Fionna the Human's ball gown (Adventure Time) with a fleece hat. 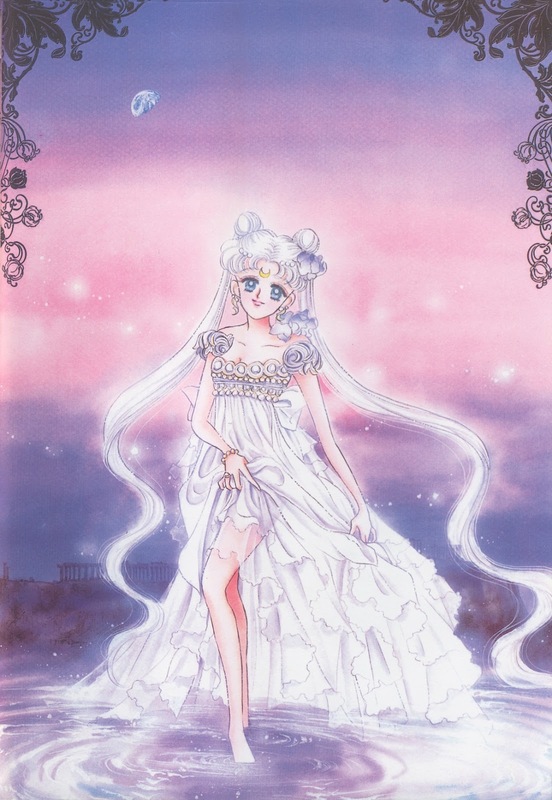 The only thing that I might change is to add an overlay of net or chiffon to the skirt. It would be a little bit expensive to do so, because chiffon costs around 6.50 Euro per metre, and I'd need around 5 metres for a half circle skirt, though I could get away with about 3 metres if I made a gathered skirt.